When you’re travelling you will end up socialising more than normal. You’re constantly meeting new people, making friends and experiencing new places meaning every night seems like your first or last in that town, so what better way to celebrate than over a beer? With that in mind, it’s important to know where all the great cheap nights are! Check out this guide for some cheap supping every night of the week! Boozy Bingo is a Melbourne (more specifically St Kilda) institution within the backpacking scene. Held every Monday evening at Red Eye Bar St Kilda, it’s a night quite like no other. Veludo is one classy establishment, but the great thing is that we can afford to drink here places on Tuesdays! With it’s exposed brickwork, long-room style bar and fantastic people watching balcony, Veludo cuts an elegant figure down the stylish Acland Street but all is set aside on Tuesdays when Veludo becomes CHEAP HOUSE. There are not many high-quality bars you can have a good night out on less than $50 but when basic spirits, wine AND Coronas are $5 and there’s guest DJs every week why would you go anywhere else on a Tuesday?! Melbourne is famously snobby when it comes to its drinking holes. You don’t simply find a good pub in the most obvious places, oh no. All of the best bars are hidden secrets and sometimes in the grimiest spots and none more fit the bill quite like Sister Bella. Down one alleyway, down another, behind the bins (yes really, see photo) and up the stairs and you have a funky space (complete with snapped skateboards hanging from the ceiling) with a rustic feel. Its cheekiness runs through from the naughty (see photo) yet amusing wall art to the charismatic bar staff. Icing on the cake? $10 jugs every night. Welcome to Travel Tip: Try the Pirate Drink, go Deluxe if you like the spice! 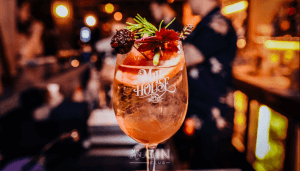 We’re jumping on the 16 tram from St Kilda to the City and staying classy with a visit to The Mill House, Welcome to Travel’s favourite joint in Melbourne. The Mill House attracts every type of winer and diner throughout the week, but they make Thursdays for everyone with 2 for 1 cocktails! Once you’ve ticked off that menu you’ll forget you’re a backpacker on a budget and more than likely indulge in their long gin list or wide range of Moonshine, yes Moonshine! Whatever you’re drinking it won’t be long before you make this your regular Thursday hangout and justify the hungover stories with ‘Yes, but it was a Thursday’. Bar Crawls definitely give value for money, but is there one that is more fun than the St Kilda Bar Crawl? With the groups of over 80 people each week they head to a mix of local and backpacker bars and with legendary bar crawl organiser Jordan Bews and the team behind Boozy Bingo, you’re guaranteed to have a great night, drink lots of alcohol and win a few beads (that will make sense when you’re on the bar crawl). How could it be anything else? There’s so many bar crawls that go to the same kind of venues with a similar kind of vibe and that’s why they quite often end up being something you do once. That’s not the case with Melbourne Bar Crawl. Every week these guys take 150+ people to four top Melbourne bars (each with a drink included! ), line your stomach with pizza on the way before delivering you to Melbourne’s biggest commercial Saturday night, Billboards. Welcome to Travel: Melbourne includes this as part of your package!